Unilite SLR-3000 rechargeable LED Site light. Offering unrivalled light spread and power, the unit operates using a 7.4V 6600 mAh Lithium-Ion rechargeable battery. Weighing only 1.8kg the SLR-3000 site light is made from super tough polycarbonate for increased robustness and durability, and the rugged anti-glare lens also helps to ensure that the Samsung SMD LEDs are housed and protected from drops and falls. 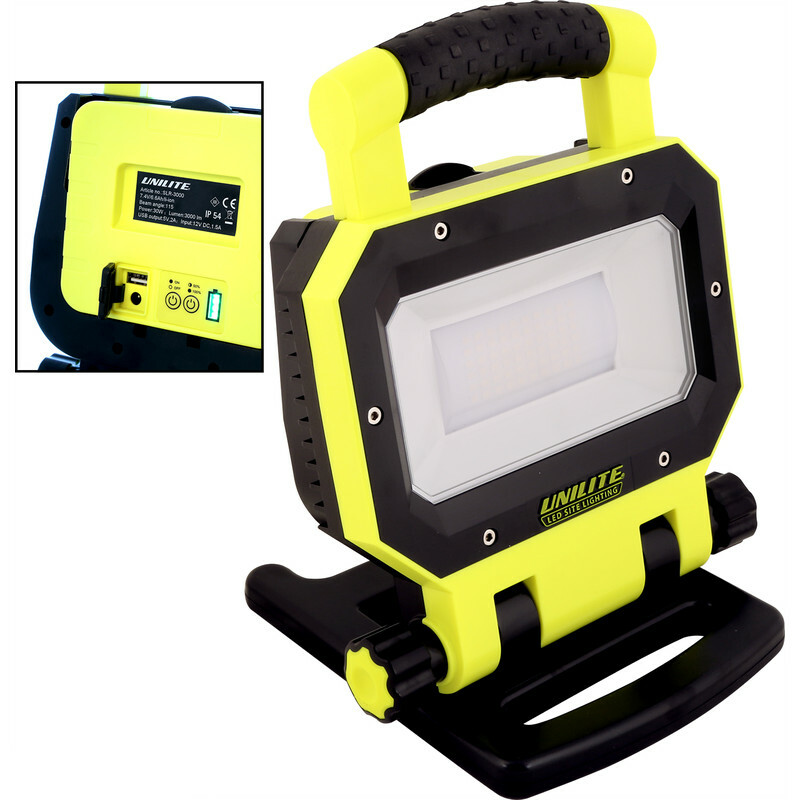 Unilite SLR 3000 LED Rechargeable Work Light 30W 3000lm is rated 5.0 out of 5 by 4. Rated 5 out of 5 by Beaufighter from Excellent product Superb work light. Many features that justify the higher cost than others. Sturdy construction and bright light are most important but added features include magnetic base, adjustable stand and a charging outlet. I have no hesitation in recommending this and glad I did not buy a cheaper alternative. Rated 5 out of 5 by Grantham from Well built and 'neat' looking Compared to other makes the flood effect seems much better watt-for-watt,more even spread across the beam and the 'diffuser' is welcomed. It is certainly 'prettier' than most. For me it would have been helpful if Toolstation stocked spare batteries. So far that is my only crticism. Rated 5 out of 5 by bobmalc from Great performance I already had a 10W 'site light' but I needed something more powerful urgently. So I bought a slightly cheaper work light from a certain competitor and was bitterly disappointed. Next day I ordered this from Toolstation and was not disappointed. Not only is it powerful, the anti-glare lens works pretty well too (glare from powerful LEDs can be a real problem). And it seems to be very well made and robust.